Thumb pain can be caused by a variety of conditions affecting the joints, tendons, ligaments and muscles of the hand. Osteoarthritis of the thumb is one of the more common conditions to cause significant pain and loss of strength in the hand. 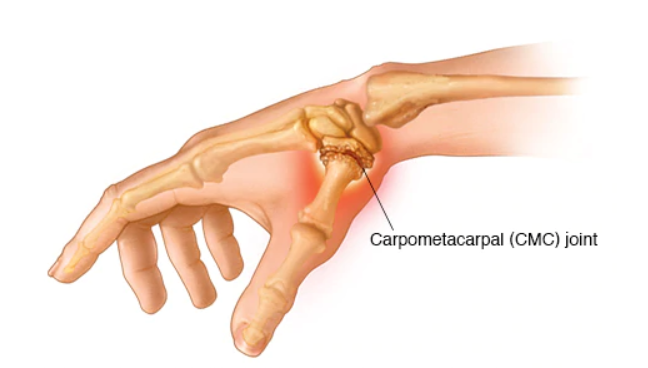 It often results from a combination of factors including family/work history, repetitive motions with applied force, awkward thumb postures from sports, work or recreational activities, previous fractures, trauma or dislocations to the thumb. The thumb accounts for 50% of our hand function so when it is painful or weak it gets our attention! Why it is so painful is because the hand is highly innervated and occupies a large amount of sensory motor space in the brain. The CMC joint is a saddle joint and is the second most mobile joint in the human body. Often simple tasks involving the thumb create pain. Osteoarthritis usually occurs when there is a loss of joint space between two bones at the base of the thumb. Due to the high degree of mobility at this joint it is prone to wear and tear from activities that we perform every day. This results in loss of the cartilage or cushion between the joint. The ligaments that surround this joint can also become stretched out and begin to no longer provide the stability you need when applying force. The symptoms of thumb arthritis of the base of the thumb joint are pain with pinching, gripping and general thumb use. People often start to notice subtle pain in their thumb that gradually increases as early as their 40’s and 50’s. How can an Occupational Therapist help with arthritis at the base of the thumb? An OT will provide a comprehensive assessment for strength, range of motion, joint integrity including a profile on how you need to use you hand and thumb on a daily basis at home, work, and with recreational activities. From that information we will build a treatment program and education program that will address how to continue to use your hand safely, reduce pain, return full strength and select appropriate supportive orthotics , splints or taping that can greatly reduce pain and improve your function! Don’t wait… with early self-care and a preventative strategy you will decrease pain and keep your thumb in less pain and still be able to enjoy many of your activities.